For the third year in a row Crosby’s Molasses will be providing a sweet treat to all FBC2015 attendees, and they’re inviting you to come up with the treat idea. 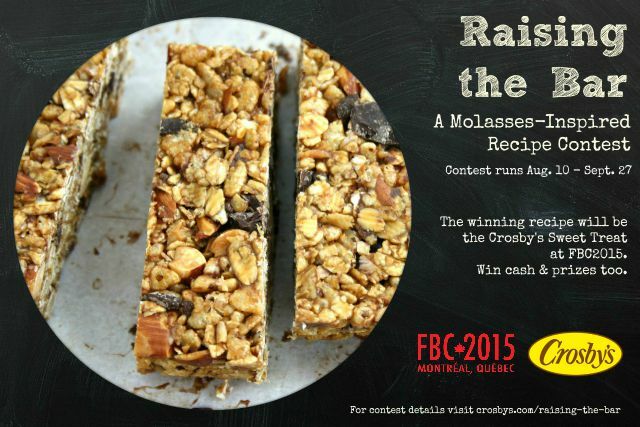 Crosby's Molasses is running a contest for FBC members to create a delicious bar recipe. The winning recipe will be the Sweet Treat distributed at FBC2015 in Montreal this October. A personalized hand-thrown pottery mixing bowl and baking gift basket. The winning bar will be featured as the Crosby’s Treat at FBC2015, with full recognition for the winner. The winning bars will be featured in subsequent Crosby’s eBooks, with full recognition and links back to the winner’s blogs. The winning bars will be featured in the Crosby’s October eNews, distributed to 15,000 molasses fans across the country, with full recognition and links back to the winner’s blogs. One (1) Winner to receive: A personalized hand-thrown pottery mixing bowl and baking gift basket, $200 cash PLUS the entry will be featured as the Crosby’s Treat at FBC 2015 PLUS the entry will be featured in Crosby’s eBooks and October eNews. For full contest and recipe guidelines as well as how to enter, visit the Crosby's Molasses site. We can't wait to see all the tasty treats you come up with.